If you go to a plugins support page, there is not an easy way to be able to visually see which post have been resolved. 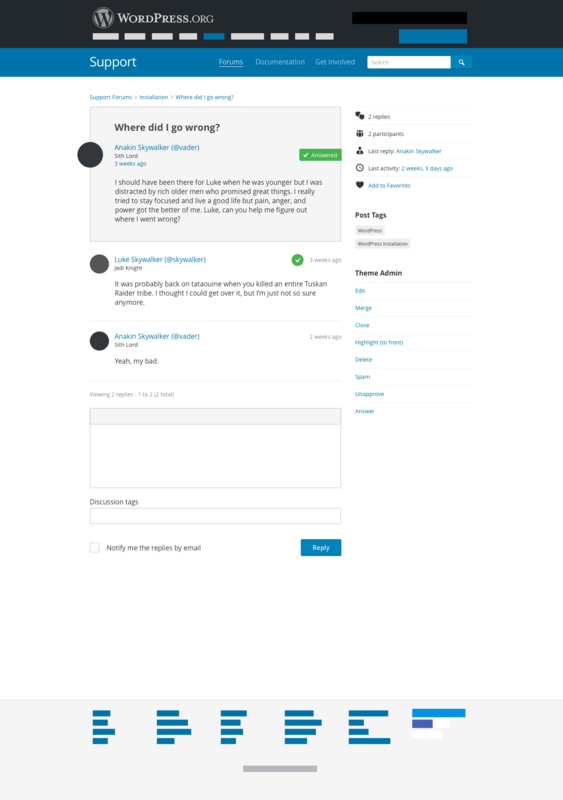 Support Theme Resolved Color Change.png​ (144.4 KB) - added by lukecavanagh 2 years ago. meta-2359_topic-view_plain.png​ (185.6 KB) - added by coffee2code 2 years ago. Prepending of plain green checkmark before topic title in single topic view. meta-2359_topic-view.png​ (188.9 KB) - added by coffee2code 2 years ago. More prominent green checkmark badge of sorts before topic title in single topic view. Each topic title has "[Resolved]" in front of it, which is a good visual indicator that it has been resolved. I'm not keen on highlighting resolved topics with a different color or otherwise because I don't know for which audience that would be useful. Making resolved topics stand out makes the unresolved ones less visible when scanning the list. Do plugin authors want resolved topics to be highlighted? Why? Some sort of visual indicator (that is more than just the 'word' 'Resolved') would be helpful, yes. The old system did this before the forum theme was changed. It was one of the reasons it was so easy to 'work the support queue' and hit all the tickets that hadn't been either responded to or resolved. An icon (that had an ARIA value) would be helpful. You don't have to show them to all 'users' of the forums, just the ones that are Admins of the plugin in question. Some sort of visual indicator (that is more than just the 'word' 'Resolved') would be helpful, yes. Got it. @mapk had a checkmark in the mockups (can you post those? ), but we ran into some technical issues implementing it. @coffee2code, can you help out here? We'd want to convert "[Resolved]" to a checkmark with the appropriate ARIA value. Ignore some of the other stuff, but you can see the checkmark there along side the topic title. Pretty simple, and follows format of the other icons like the pin. Leave as-is and prepend "[RESOLVED]" before titles of resolved topics. Prepend a plain green checkmark as done in the topic listings. See meta-2359_topic-view_plain.png​. I have this just about ready, but no consideration had been given to single topic views, where "[RESOLVED]" was also being prepended to the topic title. I actually had a mockup for that as well. Here it is. @mapk: Looks good! That should work. These Star Wars themed conversations are hilarious. Support Forums, Topic Resolution: Denote resolved topics in better ways than prepending "[RESOLVED]" to topic titles. Prepends markup to resolved topic titles in topic listings, suitable for being shown as a checkmark. 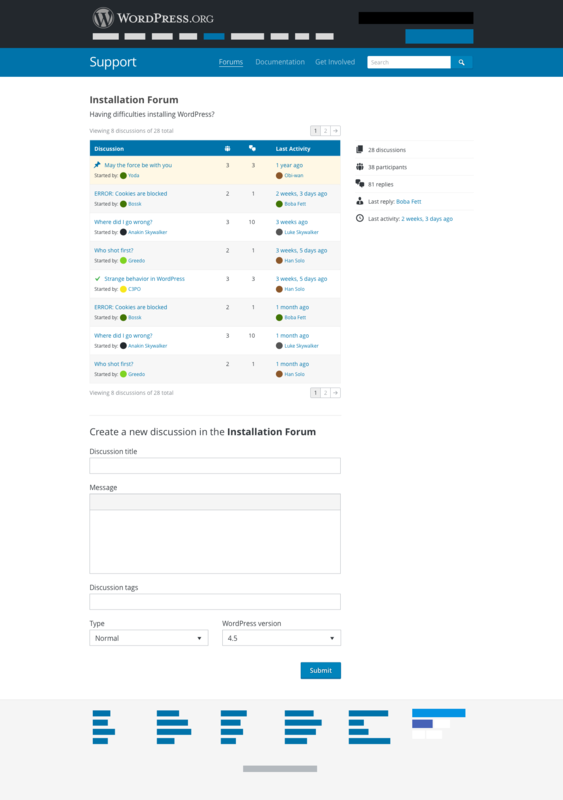 Outputs resolved indicator in single topic view for resolved topics, with the text "Answered". Discontinues prepending "[RESOLVED]" to topic titles. Wow, Great work @coffee2code and @mapk Looks great and much cleaner! Support Theme: Prepend titles of resolved topics with green dashicon checkmark instead of "[RESOLVED]" in topic listings. Also styles resolved indicator in single topic views. Is there a reason not to use "Resolved" there? An answered topic doesn't necessarily mean it's resolved, using a consistent term would less confusing. Very true. Let's change the wording to 'resolved' in the new design. Thanks! Created #2380 for that. Support Theme: Ensure resolved topic title checkmark displays in user replies view. Also minor tweaks to checkmark styles. Forums Theme: Backport , which denotes resolved topics in better ways than prepending "[RESOLVED]" to topic titles. Slight, but inconsequential, differences to the resolved indicator on single topic views. Support Theme: Correct resolved topic checkmark position in Spam/Pending/Archived views and breadcrumbs. Support Theme: Revert  and use another approach for resolved topic checkmark styling. This keeps visual appearance the same, but removes the need for display: inline-block workaround, which caused unnecessary wrapping with longer titles.